Operating profit at Deutsche Post DHL climbed by 45 per cent to €3.5 billion last year meaning that the group hit its EBIT target for 2016. The DHL divisions generated operating profit of €2.4bn compared with €1.7bn in 2015. EBIT in the Post – eCommerce – Parcel division increased to over €1.4bn compared with €1.1bn in the previous year. Group revenue fell by 3.2 per cent year-on-year in 2016 to €57.3 billion. In addition to negative currency effects and lower fuel surcharges due to falling oil prices, the decline reflects a change in the recognition of revenue generated from a key customer contract in the Supply Chain division. The group now expects EBIT to rise to €3.75 billion for 2017 despite the fact that it sees only moderate growth in the world economy during the current year. 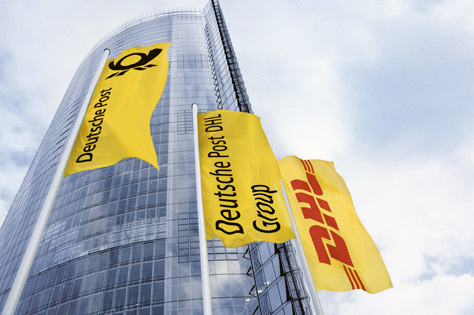 For the DHL divisions, the company anticipates an EBIT contribution of around €2.6 billion. In the Supply Chain division, revenue fell 11.6 per cent to €14.obn as a result of negative currency effects, lower fuel surcharges and the effect of the change in revenue recognition in the fourth quarter of 2015 due to revised terms in the contract with the National Health Service, a major UK account. The division signed additional contracts with both new and existing customers amounting to €1.5 billion, compared with €1.35bn in the previous year. Operating profit in the Supply Chain division improved by 27.4 per cent to €572m versus the preceding year, mainly as a result of the division’s optimisation program. Express division revenue increased by 2.7 per cent to €14.0 billion while EBIT increased by 11.3 per cent to €1.5 billion. Revenue in the Global Forwarding, Freight division declined by 7.7 per cent to €13.7 billion but it turned in an operating profit (EBIT) of €287m compared to a loss of €181m the year before. Revenue in the Post – eCommerce – Parcel division grew by 4.1 per cent to €16.8 billion. The division increased EBIT by 30.8 per cent to more than €1.4 billion.